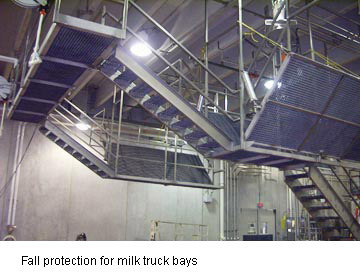 Keep employees safe while they are accessing the top of bulk transports. Lee's custom work platforms are a smart way to provide fall protection while increasing productivity. Our fall-protection work platforms are designed to effectively fit your space and enhance your operating efficiency. Moving gantries can be used to position work platforms closer to awaiting transports. Construction options include stainless steel, carbon steel, aluminum or other materials as needed. Slip-resistant grating ensures safe footing on all walking surfaces. From design to finished installation, we can complete the entire project with little impact to your daily operation. Click for enlarged photo and caption.